Hence the little me would slowly drown into a whirlwind of thoughts, my Mother’s explanation about our Handsome and Gentle savior and my Teacher’s depiction about the annihilator who might kill my friends and I because we steal cookies from the cookie jar and we fight with our siblings, confusing me. The diverse attributes converged into one personality was hard to picture for how could a savior kill sincere people who tend to sin due to temptations? And as I grew up, I would dread the reappearance of our 12th Imam for I was so sure that he’d annihilate us with his Zulfikar for we were not perfect Muslims. I’d watch in exasperation as people at the Mosques would cry and yearn for our Imam as the melodious recitations would fill their hearts with sadness. I couldn’t understand why were they even praying for that for the acceptance of their prayers would eventually lead to our doom. Perhaps that was the biggest misconception I had about my religion and about the Mahdi. I recall myself clenching my fists in dread as our Madrassah teachers would stress over the completion of almost all the signs of the Arrival of our Imam and the terrifying presence of theone eyed imposter- a monstrous figure who will fight the Mahdi-the Dajjal. It honestly seemed so unrealistic but because I was taught that Islam is a religion of truth, my curiosity about the whole Mahdi conception slowly disseminated.It was only when I mustered up the courage to confess my deepest fears to an aunt about the reappearance of our Imam was when I finally cleared my fallacies, and gradually grew fonder of the Imam. But were my teachers wrong about the Mahdi and the Dajjal? Will Imam Mahdi really kill all the sinners? Will there come a time when people will be so deluded by an ugly one eyed Man that they’ll stoop so low and Worship him? How can he take control of the Whole World in today’s era?Such detailed descriptions are undeniable but a concept hard to grasp and particularly, in today’s World. Gone are those days when a child would be silenced with one glare if he dared to question against Islam. Our children’s queries need to be answered with explanations that suit their Present time. If we will use the same old tactic by instilling fear about the Mahdi and the atrocious future that lies after his arrival, we might lose our Leaders of Tomorrow. The famous saying by the Prophet Muhammad (S.A.W) warns us that ‘One who dies without knowing the Imam of his time dies the death of an ignorant person’. Memorizing the basic biography of Imam doesn’t save us from the death of ignorance. Knowing our Imam refers to understanding his role in the 21st Century and most importantly, knowing his enemies. We need to caution ourselves against the Rising Rivals of the Mahdi-The Dajjal. As we all know, a series of narrations describes Dajjal as an imposter who is blinded by one eye and will seek to control the Earth. But is this literal or could it be a metaphorical notion? Sayyed Ammar Nakswani discusses in his lecture about the opinions that define the Dajjal as a system blinded by the sight Of the Qalb (heart) and seeking to conquer the World through their physical eyes and a scheme eradicating the good and seeking supremacy through Satanic passages. Their Rationale revolving around the all-encompassing eye, exterminating all traces of Faith and creating a secular, one-eyed and narrow minded society, devoid of Religion. At A Vague description, the Dajjal of today is defined as a system controlling the World through various circuitous means and channels. Known as the Freemasons or the Illuminati, this system comprises of the World’s most eminent and powerful personalities and popular Actors/musicians, deluding the Adults through their Movies and Music and slowly caging the young minds into their trap through the cartoons they produce, portraying acts of indecency and violence, their eye like symbol visibly seen. In short, it’s about time we track on what our children are grasping from the TV and Video games. We need to educate ourselves first, then our children against our arch enemies- the Dajjal of today. On the other hand, we need to replace their Ben 10 and Spider man heroic figures with the Imam of our time. 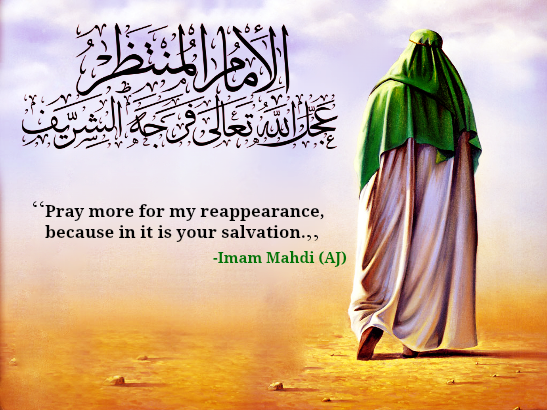 Our descriptions about the Mahdi should revolve around his Boldness despite his Kindness. His Intelligence and Vengeance, his power to Annihilate the oppressors and the wicked and not the mere sinners, rather we the believers of Imam will receive his guidance for Allah (SWT) has guaranteed a door of repentance for one who performs the obligatory actions sincerely. That Mercy will come in the form our Imam. We need our children to depict him as a Savior for those little children murdered every day in the Middle east, a Source of sustenance for the poverty struck children of Africa, a Guide for the wayward children of the West and a ray of hope for the little victims of the Earthquakes in South America and India, a hero for Humanity. If we will illuminate all the positives about the Imam and the Peace and bliss that will fill this Earth after his arrival, slowly, the Ariza we force our children to write will be filled with greetings and salutations for our Imam, his birthdays will be celebrated with an excitement like never before, our children will yearn to join the Imam’s army and gradually, we will begin to prepare the grounds of our Awaited Savior’s Reappearance. Alhamdulillah for the effort in writing this article. From the title of the Article I was expecting a Historical Analysis of Mahdi and our current shortfalls in preparing for his Arrival, more emphasis are required in these areas to wake up this sleeping community.